Mercedes me | Sears Imported Autos, Inc. If you own a Mercedes-Benz, you’re used to the best. With Mercedes me, all of your vehicle information is available in one place, along with a suite of helpful digital services. About Your Vehicle: Browse popular how-to videos or speak with a product concierge to learn more about operating your Mercedes-Benz and its systems. Maintenance & Service: Schedule service at your preferred dealer and view a snapshot of your long-term service plan and warranty information. Customer Support: If you ever need anything, Mercedes me will help you find the proper way to get in touch. The future of driving is a connected adventure, where access to your vehicle doesn’t stop when you walk away. With Mercedes me connect, powered by mbrace®, you can control your car from wherever you are. 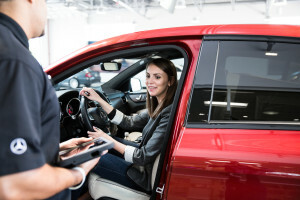 Whether you’ve leased or financed your vehicle, Mercedes me makes it easy to monitor your payments and to take advantage of our insurance and credit offerings designed specifically for Mercedes-Benz drivers. Since our inception, Mercedes-Benz has been committed to a life of luxury. It’s a pursuit that goes beyond motor vehicles, from travel to fashion to exclusive events, and Mercedes me brings it to your fingertips.